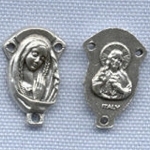 Centerpieces, crucifixes and matching sets for rosary makers. Some multi-item discounts are available, so be sure to click on each individual item to get size, maker, and discount info. Here is where you will find a variety of centers to use on your own rosary creations. Discounts are available. 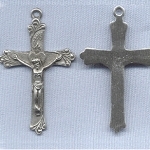 Here is where you will find a variety of crucifixes to use on your own rosary creations. Discounts are available. Here is where you will find a variety of complete 2 and 3 piece sets to use on your own rosary creations including my cancer sets.